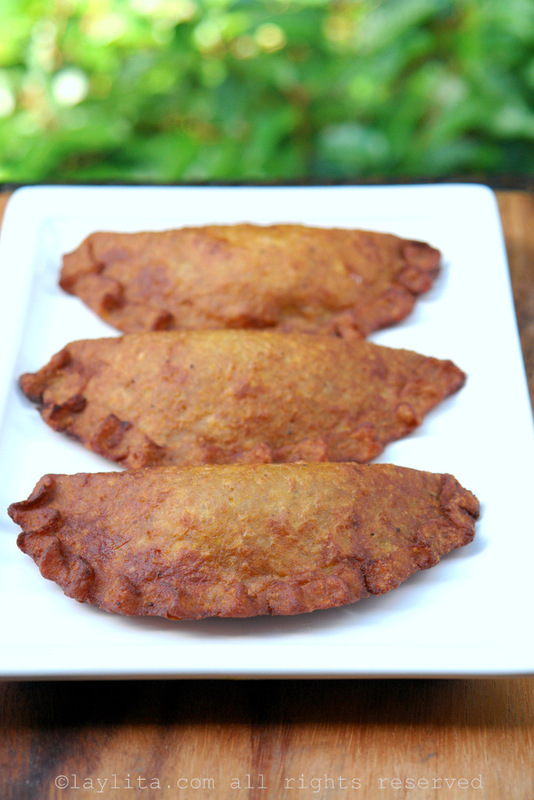 These green plantain empanadas with cheese, called empanadas de verde con queso in Ecuador, are naturally gluten free empanadas made using a green plantain dough and filled with mix of cheese and onions. 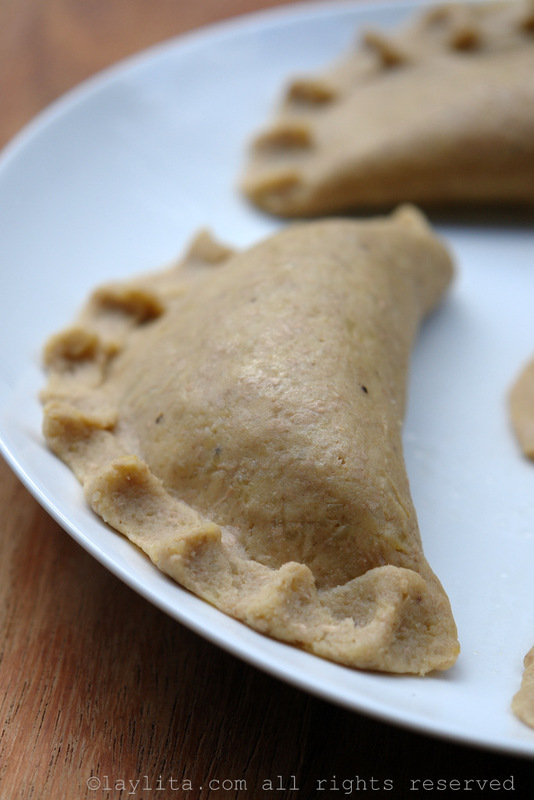 We hardly ever made empanadas de verde or green plantain empanadas at home when I was growing up in Ecuador. Mainly because it was easier to go to the market and buy the plantain empanadas freshly made, already assembled, and just needed to bring them home and fry them for breakfast, lunch or dinner. 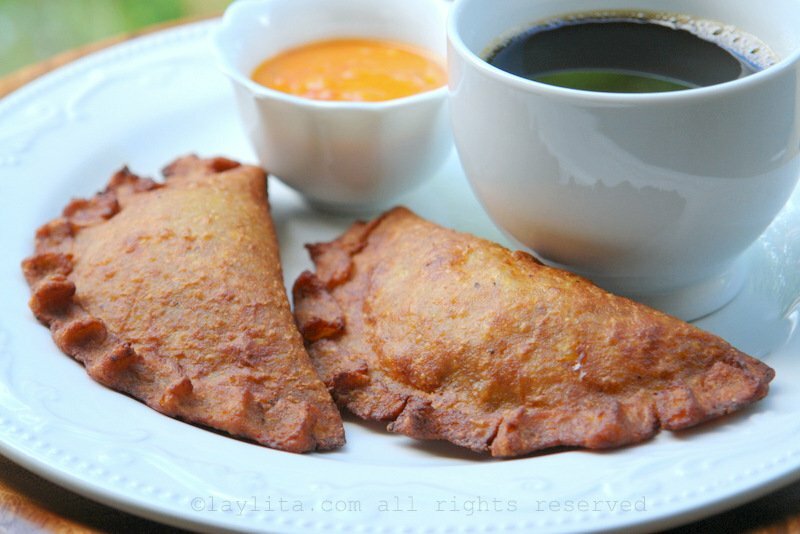 These green plantain empanadas are also served at many coffee shops and restaurants. The empanadas are best eaten warm, freshly fried or cooked on a griddle, and are usually served with aji criollo, a spicy hot sauce, or tree tomato aji. 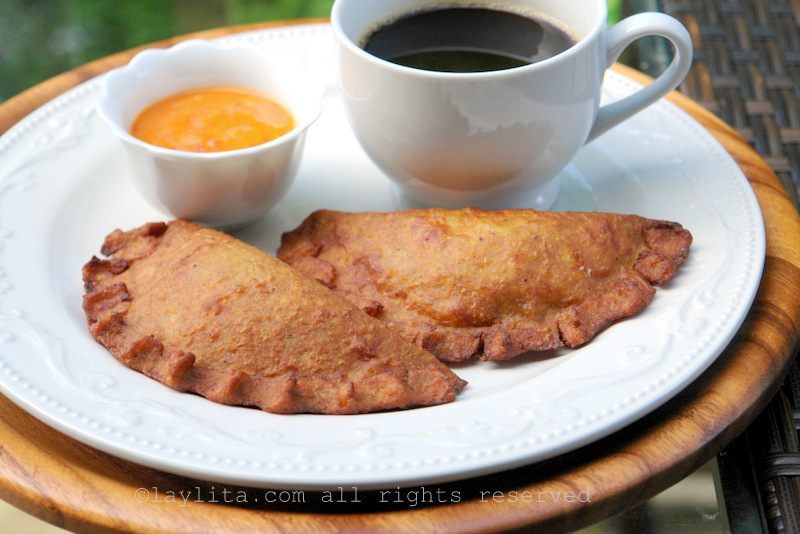 The empanadas can be made small to be served as appetizers or large to be served as the main course. 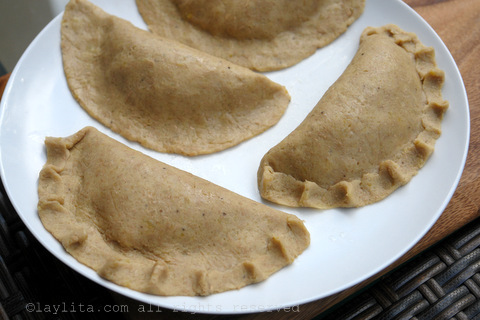 Green plantain empanadas with cheese, or Ecuadorian empanadas de verde con queso, are gluten free empanadas made using a green plantain dough and filled with cheese. Wash and peel the green plantains, be careful as green plantains tend to stain clothes and cutting boards. It works best to do this under running cold water. Cut three of the plantains in half. 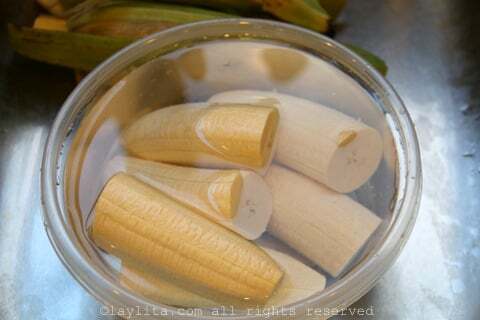 Keep the remaining peeled plantain in a bowl of cold water. 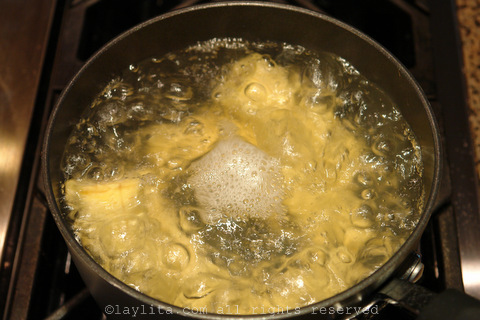 Bring water to boil in a large saucepan and add the 3 plantains. Cook until tender, about 30 minutes. Exact time will vary based on the greenness of the plantains. Remove from heat and let the cooked plantains sit in the water they cooked in until they are cool enough to handle (but still warm), if you remove them from the warm water they will get too hard. In the meantime, grate the remaining raw plantain using a very fine grater. 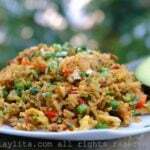 Place the cooked plantains in a food processor and pulse until you have a thick coarse mix. Add the egg and butter or oil, and pulse until the ingredients are well mixed and the dough is a little smoother. 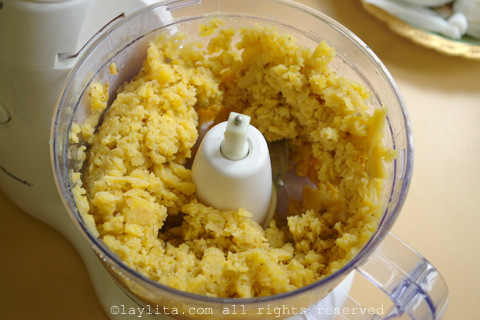 If you don’t have a food processor, you can mash or grate the cooked plantains and then mix them with the egg (lightly whisked) and the butter. 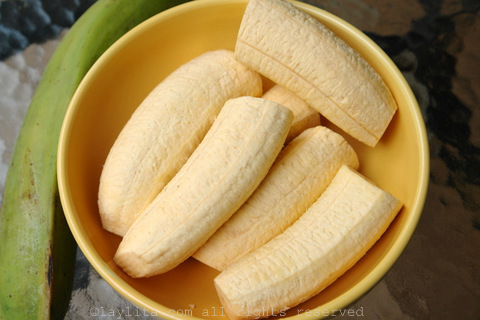 If using the food processor, remove the plantain mix and place it into a large bowl. Rub your hands with a bit of butter or oil, and mix in the finely grated raw plantain and ½ to 1 teaspoon of salt (adjust based on how large the plantains are and your level of tolerance for salt). Use your hands to work the dough until you have a smooth mix. If the dough is very dry or too sticky, you can add a bit of the cooking water from the plantains – you will likely need to this if you didn’t use an egg. Form the dough into a ball and let rest in a bowl at room temperature for about 15-30 minutes. You can also save it to use later and store in the refrigerator for 24 hours, but when you remove it from the refrigerator, let it rest for at least 30 minutes at room temperature. As mentioned above you can make the empanada discs by either using a rolling pin to flatten the the dough into a thin sheet. The dough can be difficult to handle, use oil on your hands and on rolling pin to keep the dough from sticking. 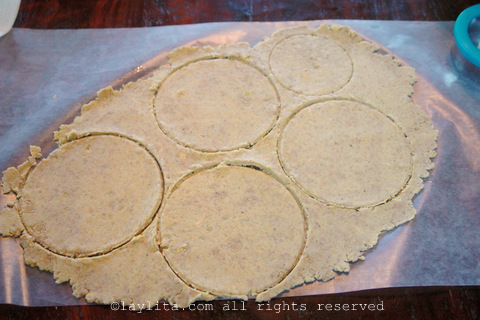 Use a round pastry cutter mold (or round bowl or cup) to cut out round disc shapes. The size of the empanadas is up to you, I usually make them medium or small sized if I’m serving them as appetizers or sides, or large if I’m serving them as a main meal. 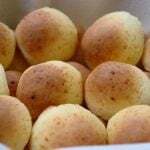 The other option for making the empanada discs, is to shape the dough into small balls – golf size for small ones and tennis size for larger ones. 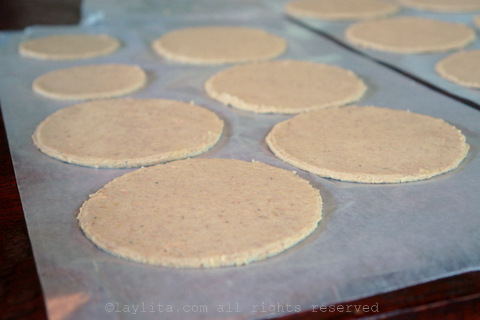 Then flatten these balls of plantain dough using a tortilla press or something flat, like a cutting board. You can also use a rolling pin to roll out each individual ball into a round disc – don’t worry if they aren’t perfectly round. 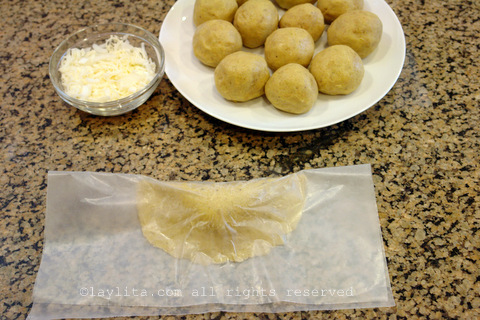 It helps to place the dough balls in between pieces of wax paper (lightly greased) to keep it from sticking to the board, tortilla press, or rolling pin. Mix the cheese and the onions together. 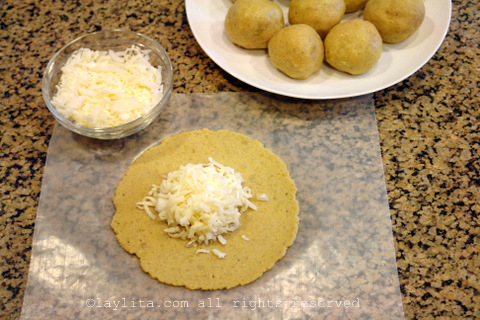 Place a spoonful of the cheese and onion filling in the middle on the empanada disc, fold and seal the empanada. You can also do this using a piece of wax paper. To seal it correctly press the edges gently with your fingers. You can also use a fork to help seal the edges. 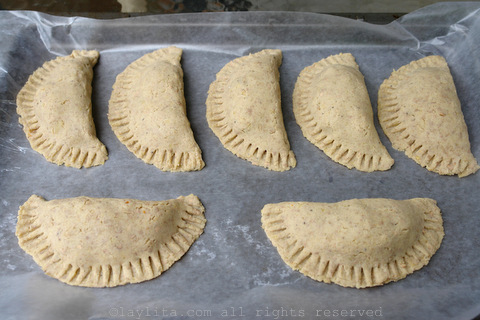 Let the empanadas sit in the refrigerator for about an hour, this will help them seal better. It is possible to fry the empanadas immediately, but they are more likely to open or leak while frying. Heat the oil in a large frying pan over medium high heat. 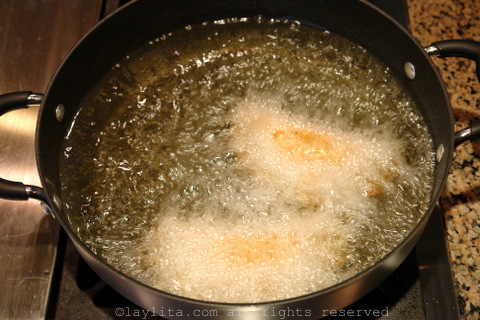 As mentioned before, you can deep fry them or you can use just a few tablespoons. 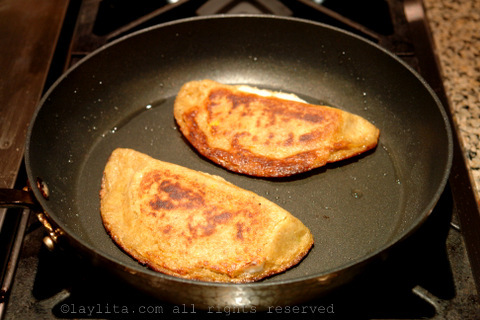 Add the empanadas, do not overcrowd the pan, and fry them until they are golden and crispy. If using a small amount of oil you will need to gently flip them over so they cook on each side, about 3-4 minutes per side. Drain the oil from the empanadas by placing them on plate lined with paper towels. 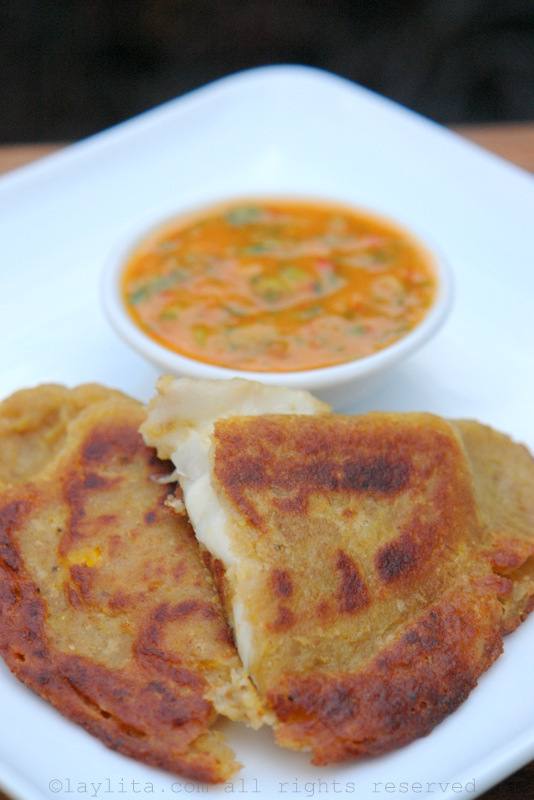 Serve warm with aji criollo or tree tomato aji. Empanadas de verde or green plantain empanadas can made with different filling options, the most popular fillings are cheese, ground meat, or shrimp. Another variation also includes adding a bit of ground peanuts or peanut butter to the dough mix or even to the filling. The empanadas de verde con carne or meat are great as well, but there is something so perfect about melted cheese and green plantains. The dough can be a little bit difficult to manage because of the starchiness of the plantains, but I’ve tried a few different methods to get simplify the dough making process. Of course, making it frequently, which applies to any kind of empanadas, also helps. Every time I make these plantain empanadas I tell myself I need to do so more frequently or move back to Ecuador. 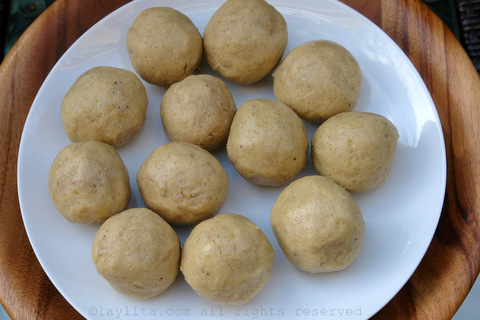 The dough is made with a mix of boiled green plantains and a raw grated green plantain. My first tip for making the dough is to make sure that the cooked plantains don’t get cold, keep them in the water they cooked in so that they stay warm. I also use a food processor to grind the cooked plantains. Just be careful not over mix them in the food processor. If you don’t have a food processor you can either mash them or use a grater. 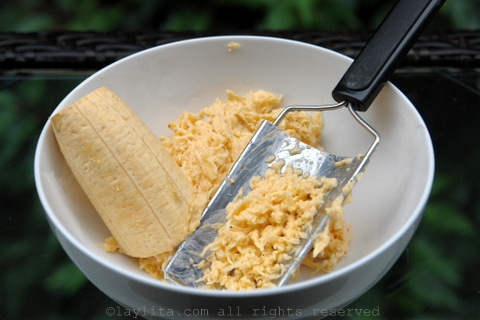 The raw green plantain needs to grated using a very fine grater, the raw grated mix will be very sticky and will help glue the rest of the ingredients together. Another tip for dealing with the starchiness, and therefore stickiness, of the green plantain dough is to add an egg to the dough. This isn’t traditional and most places in Ecuador don’t add an egg to the dough, but I find that it makes the dough easier to handle. You can also add a few tablespoons of the warm water that the plantains were cooked in – this can be in addition (if the dough feels too dry) or instead of the egg. Adding butter (or oil) to the dough also helps, and you can also rub your hands with a bit of butter or oil to make it easier to mix the dough. 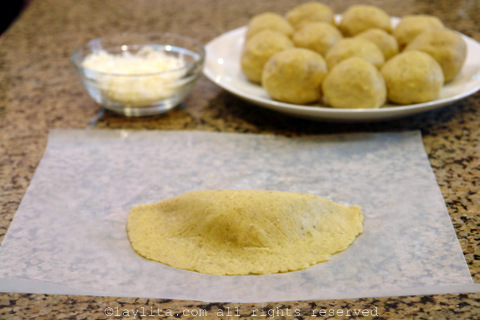 Once the dough is made, you can either roll out the dough into a thin layer and use a round pastry mold to cut out discs – basically the same method as when making traditional empanada dough. 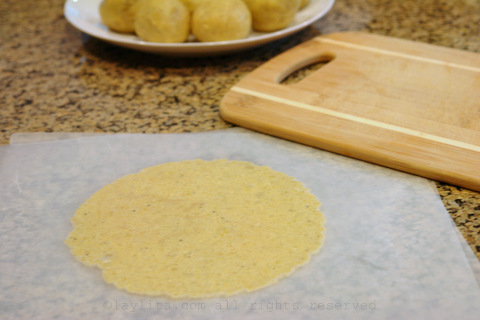 Another option, and this one works better for this sticky plantain dough, is to shape the dough into small balls and then flatten these balls using a tortilla press or something flat, like a cutting board –a rolling ping also works. Put the dough balls in between pieces of wax paper (lightly greased) to keep it from sticking to the board, press or rolling pin. 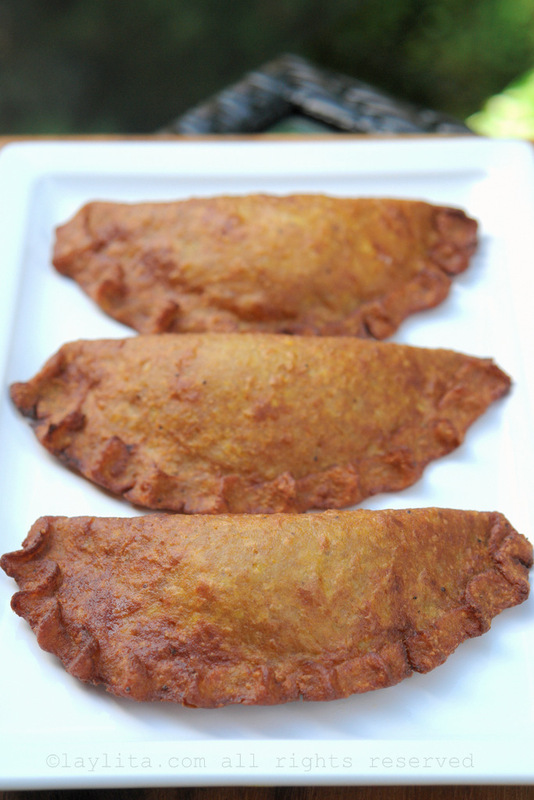 In Ecuador, these plantain empanadas with cheese, are usually deep fried. I prefer to cook them in just a small bit of oil – if you do this, then you will need to turn them over to make sure they get nice and crispy on both sides. The dough is semi-cooked, so they don’t need to cook for a long time, mainly get them nice and golden and hot enough to finish cooking the dough and melt the cheese. 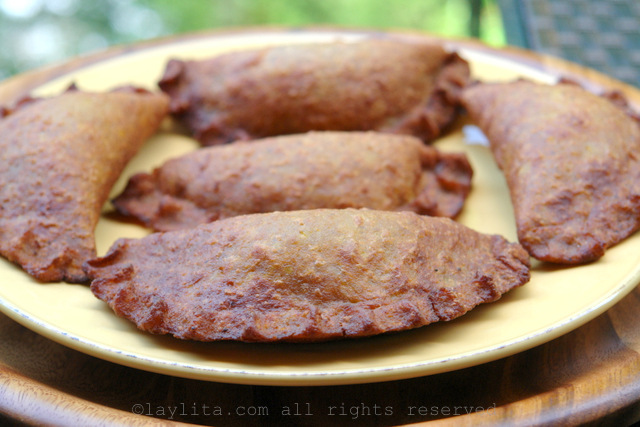 These green plantain empanadas can be served as is, though in the Sierra or Highlands we usually serve them with some aji or hot sauce on the side, tree tomato or tamarillo hot sauce is my favorite for empanadas de verde. Aji criollo hot sauce is another option, and for a non-spicy option you can also serve them topped with a bit of cebollas encurtidas or lime pickled red onions. 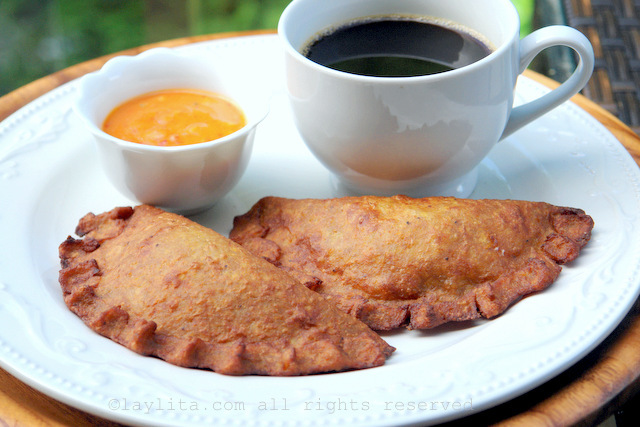 These gluten free plantain empanadas with cheese are perfect for breakfast or brunch with a cup of hot black coffee. They can also be served as an afternoon snack or as an appetizer. Sure, of course, you can sautee the onions first, let cool down and then add to the filling. You can also just omit them completely. I live in Ecuador, but we don’t eat out very often. So sometimes even in Quito your recipes are my first experience with this food (bizarre, I know, particularly since my partner is Ecuadoran). The recipes sometimes are helpful in other ways, such as making sure I have the right ingredients because I can flip to the Spanish version and verify the food names. This recipe is fantastic, and the tip about rolling the dough discs out between oiled wax paper was fabulous. Without the wax paper (or possibly plastic wrap), it would be virtually impossible to get the disc — much less the stuffed empanada — off the surface you rolled it out on. Really. That makes all the difference in the world! 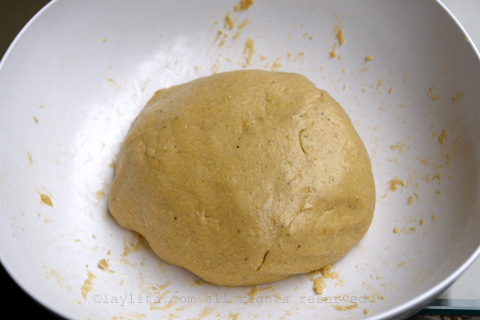 I’m curious if you’ve ever baked your green plantain dough versus fry? Didn’t see any comments. Thanks! My mom does that sometimes with ones she buys pre-made in Ecuador and I don’t like them very much when they are baked – they get very tough and hard. If you don’t want to fry them, then you can cook them on a griddle pan (just lightly greased) on each side. The empanada dough is almost cooked, so they just need a little bit of time to finish cooking, melt the cheese inside, and get a nice crispy sear. Yes, to freeze them place them on a tray lined with wax paper, let them freeze and as soon as they’re frozen you can transfer them to a freezer bag and return them to the freezer. I am new to Equadorian cooking and find it fascinating. I have to say your website is wonderful! I especially like the photographs and the history of the dish that you give. Well done! I absolutely love your site. I cannot thank you enough, the recipes are all amazing, the descriptions and photos make it all achievable. I have been craving these since visiting Quito a few weeks ago. This recipe is PHENOMENAL, and now my entire family is addicted! Thank you for sharing it with everyone! 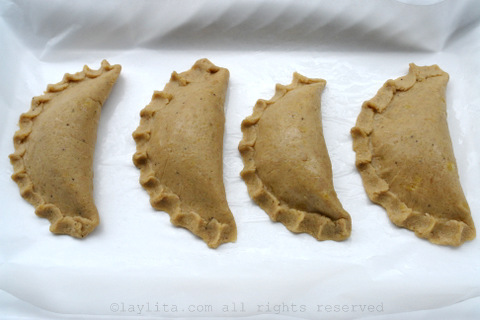 To plantain empanadas stay sealed easier than dough-based ones? Yes, they do, the dough is starchier and stickier so it seals better. I made this last night and they turned out great; I even substituted the egg out for an interesting alternative — flaxseeds (linazas en español) since I’m allergic to eggs. You just simmer some seeds in water until the liquid becomes really gelatinous, kind of like an egg. 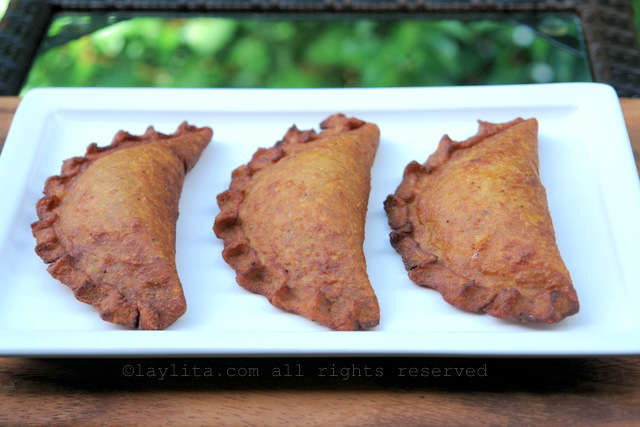 Works perfectly and although its not traditional it does give the empanadas some extra flavor. Thanks for the recipe! I’ll be trying some other ones soon. BTW my mom’s half Ecuadorian and I live in Cuenca. Hi Laylita, I really appreciate all of your recipes, I grew up in Ecuador but I did not learn how to cook some of our wonderful food. I always thought it took to many steps and I did not have the time. Now that I want my kids to learn to eat Ecuadorean food, your website has helped me a lot. I live in a beautiful city – Sarasota – in the Southwest part of Florida and sometimes is hard to find certain ingredients, but I can find most. I am enjoying your website greatly. Thank You again. I JUST FOUND YOUR WEBSITE BY ACCIDENT SEARCHING FOR A CEVICHE RECEIPE AND I LOVE THIS WEBSITE ALREADY, I COULD NOT BELIEVE THAT YOU HAD THE RECEIPE FOR THE SOPA DE BOLAS!!!!!!!!! MY GRANDMOTHER AND AUNT MAY THEY BOTH REST IN PEACE USE TO MAKE THIS FOR ME AND I THOUGHT I WOULD NEVER EAT IT AGAIN! AND NOW YOU HAVE MADE IT POSSIBLE TO HAVE THIS MOST DELICIOUS SOUP AGAIN! MY MOM IS GOING TO MAKE IT……MY QUESTION TO YOU IS DO YOU HAVE A PUBLISHED COOK BOOK MY MOM WANTS TO KNOW………THANK YOU SO MUCH FOR THESE MOST DELICIOUS RECEIPES!!! Ahhhhhhhhhhhhhhhhhhhhhhhhhhhhh! Brought back lots of memories; my aunt Sonia, bless her soul used to make them when I was growing up in Ecuador. I grew up en El Carmen, Ecuador in Manabi; she made them sooooooooo good of all types: Cheese, beef & chicken; she also made delicious arroz colorado con pollo (yellow rice with chicken) She cooked like the goddess!!!! I learned to make empanadas de verde with her, but haven’t made them in years; I’ll try this time with your wonderful recipe. Thank you very much for keeping our roots alive through the ecuadorian kitchen. Thank you for the recipe. I love these. I came to the US when I was 13, and went back to visit family with my husband and 2 kids last summer; and these were just so delicious!!! I wish I could have my own little Ecuadorian market here in Colorado! Thanks so much! Reading your blog and the recipes, and looking at the beautiful photos, I can’t help but think you should have a cooking show or appear in Martha Stewart or in one of those morning shows. The elegance yet creole sensibility with which you write your recipes and talk about them, it brings back memories of bygone years and that desire to always go back to your roots. I’m from the coast of Ecuador, Portoviejo to be exact and it’s so hard to find some of those particular ingredients that make the difference in taste in our typical dishes, specially the cheese!. I love what you’re doing in your website, keep up the good work! I’ll be checking back often, you’ll be in my bookmarks! Que Viva el Ecuador! I´m from Venezuela but I was working in Ecuador for two years! I just love Ecuadorian food! Thank you so much for this blog. I always wanted to know how to make empanadas de verde, bolón de verde, also yapigachos and encocado de pescado!! I love these recipes. I tasted empanadas the verde for the first time a couple of years ago when I visited Esmeralda. I’m from Ecuador and I love Ecuadorian food. Nice recipe, tastes spectacular, especially the cheese. The recipe works really well, and i found it very easy to make. It’s great to know that you are from Ecuador, i was born there too, and i love the food from there. This reminds me of when i was younger, it brings back a lot of great memories, especially since i haven’t yet gone back there since i came to London.